And that’s just the interest. Which is exactly why Monnet Ispat went down. It couldn’t pay the interest. In 2014, Monnet got into trouble when its coal mine licenses were cancelled after a supreme court ruling removed all mine allocations since 1993. The loans it had were a consolidated 10,000 cr. at that time, and they couldn’t earn enough to pay the interest. So the company’s lenders tried to do exactly what a new RBI scheme, SDR, allowed it to do. In 2015, lenders took about 51% of the company for a mere 370 cr. (converting part of the debt) Now the banks owned the majority of this steel company. After this, they said: “What are we doing owning a steel plant? Let’s try to sell”. And then many rounds of bids later, only JSW Steel emerged with an offer, and even then the banks didn’t want it. They went the NCLT then, taking the company into bankruptcy resolution. And that process is now nearing it’s end. Meanwhile the share continues to trade, at values of Rs. 27 per share or so, jumping up and down as the resolution process continues. There are pundits that say there’s so much value in this company! That such a lovely 1.5 million ton plan that should have so much value in the market, but the company has a market cap of just Rs. 540 cr.! Isn’t this brilliant? The answer, to make life very boring is: NO. When a company isn’t able to pay debt, that is like your owning a house and not being able to pay back the EMI. What happens? The bank will take over your house. Then it will sell it. Someone may come and offer them only half the amount outstanding on your loan. They might take the offer. 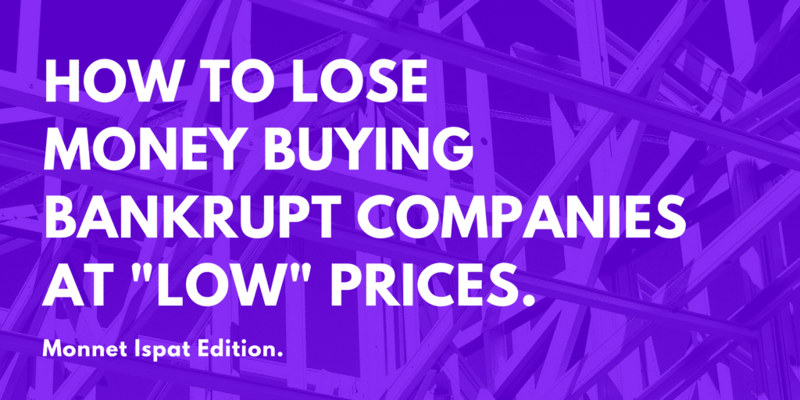 Then, you don’t get any of your down payment or any earlier money back. You simply get nothing. In a corporate bankruptcy, the concept is similar. The company can’t pay its debt. So it’s effectively taken over by the lenders, who then try to sell it to someone else. If that someone else pays a lot less for the company than the outstanding debt, current equity holders will get nothing (or very little). The IRP is now the CEO, the big boss of the firm. Even promoters can’t do anything further. And bidders then send quotes saying “Listen I’m willing to pay this much, and in this manner, and these are my pre-conditions”. Lenders get together and have to decide on a bidder by 270 days. And then, if no one’s decided, the IRP puts the company into “liquidation” – that means, sell all the assets and give the proceeds to debt holders. If anything’s left, then equity holders will get something. If lenders agree on a buyer, they will then proceed on the buyer’s bid plan. So, in general, you have no idea how this will pan out. Existing shareholders can go to zero in a liquidation. They can see a share price fall to Rs. 1 after resolution. No one knows how it will work, and meanwhile the share continues to trade! Let’s take an example here – the proposed Monnet dilution. They’ll give the banks Rs. 2650 cr. – a 75% write off from the 10,200 cr. owed. They’ll also add about 1050 cr. as working capital and capex. In return, all operational creditors (people who are operationally owed money, like vendors or such) get nothing. The banks get their 2650 cr. and go away. And then for equity shareholders, the structure changes. Loan from JSW steel of Rs. 125 cr. Rs. 398 cr. of new shares issued to JSW steel/Aion. Rs. 200 cr. of optionally convertible preference shares. And then the company is going to be run by the JSW/Aion combine. Great? Well, not so much if you’re a current shareholder. Remember, the stock trades at Rs. 27 or so. Let’s look further. JSW/Aion is putting in Rs. 398 cr. of equity for 75%. This is the maximum that can be owned in a public company, which is why they’re only doing equity for 398 cr. and the rest in compulsorily and optionally convertible preference shares. New shares will be issued to the banks too, and take them to 18.75%. Promoters and others will not get any new shares. They get diluted. Promoters go from 25% down to just 3%. We can then derive how the structure works. The public owns 5.55 cr. shares. This is going to be 3.27% after the NCLT resolution. There are already 20 cr. shares. And the remaining go to the banks. As you can see, the dilution is massive! But that’s not the end of it. Now for Rs. 398 cr. , JSW is issued 127.20 cr. shares. That means the price per share they pay is Rs. 3.13. Look at this carefully. We currently have 20 cr. shares. We will eventually see 322 cr. shares. That means the company will issue 150x more shares eventually, diluting existing shareholders in a big way, more than 93%. Will Current Shareholders Make Money? Current shareholders will own 1.7% of a fully diluted Monnet Ispat. Current shareholders (non promoters/lenders) own about 28% of the current Monnet – which is at a market cap of Rs. 540 cr. Put another way, current public shareholders own about Rs. 150 cr. of Monnet Ispat. To make any money, Monnet Ispat has to be worth so much that 1.7% of the new entity should be worth more than that 150 cr. (due to dilution). And that is just to break EVEN on the current price. This is incredibly difficult – let us explain. 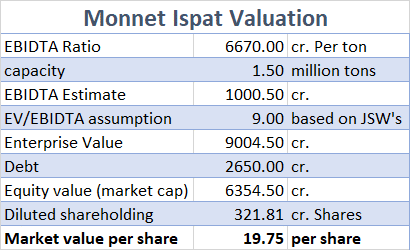 What can Monnet Ispat’s value be? Monnet has a 1.5 million ton plant. JSW has about 18 million tons of capacity. So lets see what JSW is valued at and then do an appropriate adjustment. Steel companies are valued as enterprise value (Debt plus Equity) compared to the EBIDTA they generate. JSW Steel has a marketcap about Rs. 73,000 cr., and net debt of 39,000 cr. for an enterprise value of 112,000 cr. It makes an EBIDTA of around 12,000 cr. , so the EV/EBIDTA is 9. At Rs. 12,000 cr. for 18 million tons pa, their EBIDTA is around Rs. 667 cr. per million tons of capacity. Monnet has 1.5 million tons, so at the JSW efficiency, they will make and EBIDTA of Rs. 1000 cr. The enterprise value should now adjust up to 9x EBIDTA if we are lucky – or Rs. 9,000 cr. of market cap. There’s debt of Rs. 2650 cr. now, so net of that, the market cap will be Rs. 6350 cr. For the fully diluted 321 cr. shares, that’s Rs. 19.75 per share. And that’s probably after a couple years as JSW gets the efficiency going. (Remember, they have to get coal at a relatively low price, without which they can’t get JSW-level metrics). The End Game: Losing 30% From Here? Put another way: If you valued Monnet Ispat after all the dilution, in the best case situation, the market value per share will be Rs. 19.75 per share. The company might go from a market cap of Rs. 540 cr. to a new market cap of Rs. 6350 cr. – a 12x growth – and yet, see the stock price FALL from Rs. 27 today to Rs. 19.75. That’s the power of extreme dilution. And that’s also why getting into these NCLT bankruptcy cases is a tough case at best. Even the Monnet case has risks; if they have to buy coal at higher prices, their EBIDTA will fall substantially and they’ll end up with a much lower market value. Investing requires a margin of safety – and here in these bankrupt cases, all you have is: at best, you will lose only 30% from the current price. Note: JSW will do really well, of course. They, along with Aion, will have 86% of Monnet, which should give them a value of Rs. 5,500 cr. and that’s a pretty neat profit to make in a few years, on a Rs. 875 cr. investment. But that’s how capitalism is supposed to be. Some people will profit because they have the ability to buy assets this cheap, in a fire sale. This is the creative power of destruction, for the incoming new shareholder. Current shareholders, of course, see the power of capitalism in another way: Equity holders get beaten up in a fire sale – and this was a demonstration. This should serve as a warning to current shareholders of Monnet Ispat but also to those of Bhushan Steel, Amtek Auto and the like – there is unlikely to be anything on the table for them.